A handout for APA citations created by the library and the Writing Lab. APA is one of the most important citation styles, used not only in Psychology but across all of the social sciences and other disciplines, including: Psychology, Social Work, Business, Marketing, and more. References are made through in-text, parenthetical notation and a full reference list at the end of the paper. See a librarian if you need help using this or any citation style. Purdue University's Online Writing Lab is a popular source for citation help. And unlike the Publication Manual , it's all online. 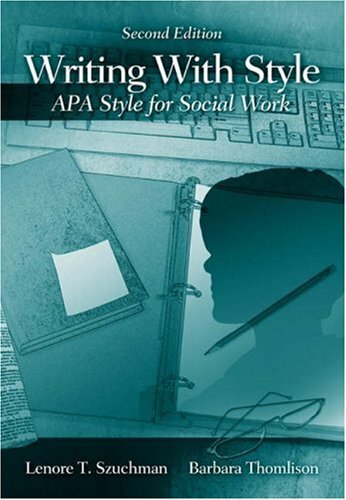 Learn about APA style in this guide published by Purdue's Online Writing Lab. This is a quick but detailed reference to working in APA style, published by Purdue's Online Writing Lab. The Publication Manual is the APA's official reference. Not only is this a good reference source for Social Work students, but it also contains an excellent overview of plagiarism that can be useful to anyone (Chapter 2, "Ethics and Writing", pp. 7-14).